Inviting readers to examine schools and teaching with a critical lens, this visually and conceptually captivating graphic novel advocates for arts education in schools. At the center of this work is the author's memoir as a young high school art teacher in the public school system. Through engaging (and frequently funny) anecdotes centered on classroom life, mixed with discussions of education policy and reform, readers explore teacher/student relationships, testing and accountability, 21st-century learning, and the history and purpose of art education. 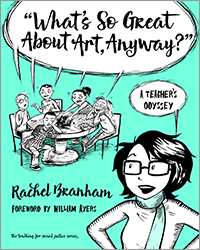 Branham's personal narrative of challenges and triumphs demonstrate why art education should be preserved as a core subject if students are to understand the connection between creativity, critical thinking, and other higher-order skills. What's So Great About Art, Anyway? is a refreshing book for everyone -- particularly for in-service teachers -- and is a smart foundational text in arts education and introduction to teaching courses.